I am forcing myself to get outdoors. This summer’s heat in Phoenix has been miserable for me. I don’t know why it feels so much more oppressive and suffocating than summers past, but it does. More than I have in a long time, I find myself hiding inside and making excuses. I don’t like excuses. After a great week in Pennsylvania, where the weather was significantly better, I felt energized…recharged. I also returned to Phoenix to find the weather was a little more reasonable and a storm system was providing some much needed cloud cover in the mornings. So, for the first time this summer, I had a solid week of outdoors activity and I didn’t want it to stop. So as the heat rose, I planned to head up north and get some trail time in around my new favorite stomping grounds…Sedona. Originally, I was looking for a nice long canyon hike that would allow me to amble along in the shade of the high red-rock walls. I day-dreamed of running along a dusty canyon trail through Cottonwoods, Junipers and Pine trees. This, unfortunately, would continue to be a dream as I did my pre-trip research and found that afternoon thunderstorms were forecast for the weekend in Sedona. Monsoon season thunderstorms in Arizona mean flash floods and a secluded canyon is not where you want to be. So, as often happens…change of plan. I browsed my Sedona Trail Map and found a few interesting options that seemed far enough off the beaten path to offer some solitude. Early Sunday morning, I got myself packed and headed north out of town. Sunday was also National Hammock Day, so part of my goal for the day was to find a good place to hang my ENO and soak in some classic Sedona views. In Sedona, I made my requisite stop at The Hike House to review trail options and take a look at their gear selection. Deb met me at the door and ushered me in to show off some of the new gear and chat. 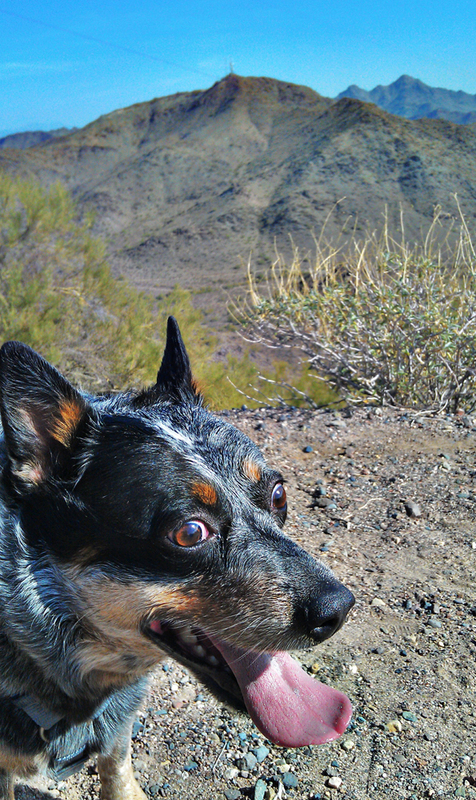 Then we looked over the map and she agreed that it would be a bad time to do any canyon hiking. In lieu of a canyon hike I wanted to summit something. Wilson Mountain was out of the question because it would get hit the hardest by any lightning and monsoon rains. I asked about a small, strenuous hike on the west end of town that climbed up into the southwestern corner of the Red Rock Secret Mountain Wilderness. Bear Mountain summit trail is only a 5 mile hike round-trip. That would make it a much shorter distance than I wanted to hike but with nearly 2,000 ft of elevation gain in the 2.5 miles to the summit, it is strenuous. Knowing it was a summit hike and storms were due to make their way in, I grabbed a cookie (thanks, Deb!) and headed toward the trailhead. There were a few cars parked at the lot that serves as the trailhead for both Bear Mountain and the much shorter Doe Mountain hike. There is a decent sized parking lot and restrooms here. There is also an automated pay-station for the Red Rock Day passes (I don’t think the passes are required anymore, but for $5 it was better to have it and not need it). This mountain looks much different on paper than it does in person. On paper, there are a couple of obvious climbs but I was not expecting the exciting geological adventure this mountain offers. The trail starts across the road from the parking lot in a relatively flat, cactus laden stretch of iconic red soil split by ribbons of deeply eroded washes. It climbs slowly straight to the base of the mountain comprised of heavily eroded cliffs of Schnebly Hill Sandstone. A steep 400 ft climb brings me to a distinct ledge of Apache Limestone that has resisted erosion enough to create a relatively level path along the wall of the cliffs above. It’s Sedona, so I’m already impressed by the views and stopping to take pictures. The rocky trail is more narrow and overgrown through this section and I am careful to watch for the cairns as I find myself nearly following false trails here and there. This shelf ends at a narrow cut in the mountain side where the trail begins another steep climb. I’m excited to see a trail becoming more technical and interesting. 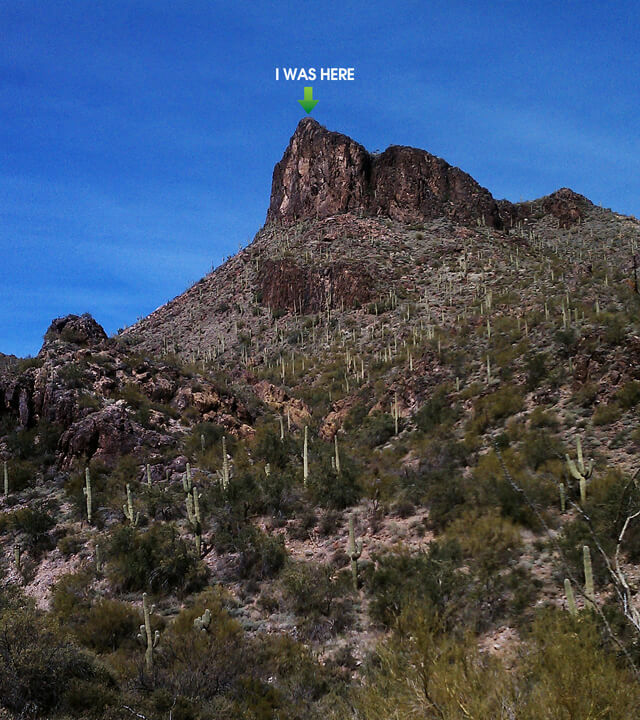 As I hoist myself up out of the ravine and on to the first plateau, I’ve left the cactus behind. Though there are still Agave, the low-land cactus has been replaced with Manzanita…and lots of it. The views on this first plateau are impressive, but I know I’ve barely started my climb. I was anxious to see more. This is the first place I run in to fellow hikers on their way back down. 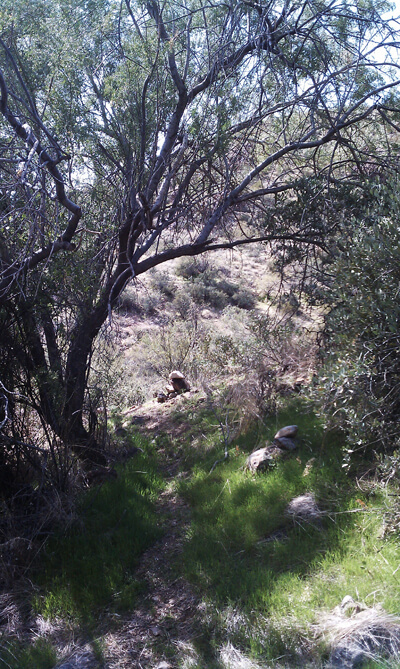 A hundred yards or so later I run in to another couple resting further up the trail. The deck at this section of Bear Mountain is a transition from the Schnebly Hill Sandstone to the very orange Coconino Sandstone. The scrubby Manzanita is thick across this deck, but still relatively treeless. Following the cairns carefully, the trail climbs another 500ft or so through a maze of rock and brush across a steeply inclined deck. The rock gets lighter as you climb eventually revealing a twisted section of sandstone, bleached almost white, turned on it’s side and eroded to reveal etched swirls and striations unlike anything else I’ve seen in Sedona. This section of the mountain becomes very narrow with sheer cliffs falling into twisted red canyons below on either side. You gotta follow the trail on the 3D map below to get a good feel for this narrow bridge of rock. It really was amazing to walk a few feet in either direction and be staring down into steep canyons, each with very unique character. This is also where the trees start to occur. I found myself scouting for a place to hang the hammock on the return hike. It was a meager selection at first, with solitary trees perched here and there. After more climbing, however, the trees became a little thicker and stronger and options were starting to present themselves. There is a plateau that sort of presents itself as a false-peak. In fact, when I got the plateau there were a couple of guys there resting and they announced “you made it!” as if this was the summit and end of the trail. Clearly, with mountain still above me and my GPS reading that I still had a quarter mile left to go, they were mistaken. I spent a few minutes taking pictures and soaking in the view from the false-summit but I wanted the top and time was running short. This entire time I’d been hiking and watching the clouds far up to the north. An innocent line of clouds that morning had slowly grown to a picturesque desert sky and then transformed into a black, shadowy mass pulsing with flashes of light and emitting a menacing growl from time to time just to remind me it was coming. I picked up the pace and made for the summit. The last push to the top is very different than the rest of the trail. As I’ve seen in a lot of summit hikes, part of the trail is less traveled, rougher and the cairns are more important to keep on the right path. The rock here is more broken and loose and the vegetation changes again becoming more scrubby with grasses and Yucca. The top is marked with a small pile of rock and a small American Flag. I paused at the top looking down across the flat, open valley to the southwest. I stood on a fractured and pitted ledge of stark white Kaibab Limestone at the precipice of a great canyon and watched two hawks chase each other and grapple in the sky below me. Then as the thunder reminded me of my time frame, I grabbed a few shots of the lone flag at the summit and moved on. One the way down I found a great spot to hang the hammock overlooking Fay Canyon where I could watch the storm roll in over Wilson Mountain toward Sedona. I was strapped between two pine trees at a ledge just 20ft or so off the trail and watched a couple of hikers pass below me. I had a little snack and some water while I rested and watched the clouds move across the horizon, grumbling deeply as it moved, white lightning splitting the sky. Before too long, I packed up my stuff and returned to my march down the mountain. I picked up the pace, jogging through the flat parts and scrambling through the more technical sections. Before I knew it was back to the narrow climb to the main deck, quickly working my way down I was back to the foot of the mountain in no time and headed to the truck just as the first drops of rain were starting to fall. I drove back into Sedona through intermittent rain. I stopped in to the Hike House again to say goodbye and grabbed a smoothie for the ride home since I wasn’t really feeling up to a full dinner. Bear Mountain really is a great summit hike for Sedona. It is a very unique experience in place where unique experiences abound. I think next time I will want to hike Fey Canyon and Boynton Canyon, the two dramatic canyons on the north side of Bear Mountain that offered such amazing views. Bear Mountain – Red Rock Secret Mountain Wilderness. Plenty of trailhead parking. From Sedona take Highway 89A west to Dry Creek Road. Follow until it dead-ends and make a left on to Boynton Pass Road toward Boynton Canyon. Another left at the next intersection will take you to the trailheads for Boynton Canyon, Fey Canyon then Bear Mountain and Doe Mountain. There is a small parking area, bathrooms and a Red Rock Pass purchase booth at the trailhead. Open: Year-round but not suggested during winter when snow is expected. My most recent quest to the McDowell’s led me to the steep trail up the boulder-clad, granite mountainside, toward the fork that would take me either east to Goat Hill, Hog Heaven and the East End or west to Windgate Pass. My destination lied just north of the well-traveled ridge-line path to Windgate Pass. I would journey in the shadow of the Glass Dome, along the Gardner’s wall, skirting the massive granite promontory known as Tom’s Thumb on my way to The Rist…where I would seek out the Ogre’s Den. I love creative landmark names and some of the best names on the planet come from river runners and rock climbers. It just so happens that the granite-strewn north end of the McDowell Mountain Range in North Scottsdale is a climbers heaven. The north slope of the range, where my trail would take me, is littered with massive chunks of granite rock. Some are huge exposed monoliths like Tom’s Thumb, a 150ft geological feature that is easily recognizable from almost anywhere in the valley. Others are piles of jumbled boulders that have collapsed on each other creating a virtual playground for rock climbers. As I had agreed to drop off some friends to an afternoon of drinking in Scottsdale, I decided I would take advantage of the opportunity and hike the trail to Tom’s Thumb. I have visited Tom’s Thumb before, many, many years ago when I was new to the valley and had no idea what this massive feature was. I simple knew I had seen it many times when driving in north Scottsdale and was curious as to what it looked like up close. Not knowing, or being aware, of any trail I simply parked my truck and climbed the mountainside to reach the huge granite feature. That was nearly 15 years ago. Now, I know the valley and I know many of the trails and landmarks and I wanted to revisit this iconic destination again…on the official trail. So I drove down the unimproved, dirt road past private property, commercial sub-divisions and open grazing land to the base of the mountain. 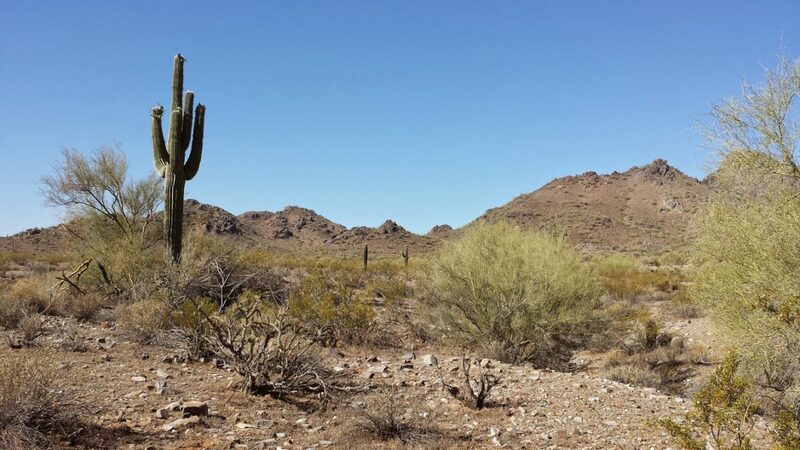 The area is now part of the McDowell Sonoran Preserve, and there are designated trails and official rules regarding the use of the area. Due to some construction near-by, there is a temporary access parking area for Tom’s Thumb located at the end of 128th street (signs are posted to guide you). The parking area would potentially hold about 10-12 vehicles but there is a smaller overflow parking area just before you get to the main one which I would guess holds about 4-6 vehicles. Luckily, this trail is not very crowded and not often accessed from the north side. Especially when you get to visit the trail mid-week, as I did. The trail starts at the northwest corner of the main parking area. There is a sign to mark the way and also warns to clean up after your pets (thank you very much). It’s a relatively easy walk at first until the trail turns sharply south and begins the switchback up the mountain. It’s not a long trail, but it does climb aggressively up. There are some great little side trails to small lookouts that offer great vantage points to the north. If you’re willing to wander off trail a little, the route offers some very unique and interesting boulders and rock formations. I did not know where the cave was…but I had heard about it. The Ogre’s Den is a small cave located “just off the trail past Tom’s Thumb“, according to the hiking books. The challenge had been offered and I accepted, we WOULD find the Ogre’s Den. Armed with an impressively vague description and no real idea where to look or what to look for, we set out “past Tom’s Thumb” to look for the cave. I admit that I wandered cluelessly across the ridge to nearly every pile of boulders that could possibly house a small cave. The only other clue we had was that there was supposedly wall paintings and artwork in the Ogre’s Den and as we both searched we hoped it would be obvious once it revealed itself. We decided quickly that we had searched too far from Tom’s Thumb and headed back, hiking around the south side of The Rist where, on a hunch, I followed a small game-trail up the south side of The Rist and stumbled upon a shallow hollow in the rock, with a well-worn floor and artwork painted on the rock walls. I called my discovery down to my new companion who quickly scrambled up the path to join me in the Ogre’s Den. We spent a few minutes exploring the small cave, finding a small shelf in the rock where past visitors have left offerings, presumably to the resident Ogre. There is also a small decorative box next to a pile of spent ballpoint pens, with paper on which to scrawl your appeals to fickle Ogre. I climbed out of the cave through a small crag above the offering shelf and found myself at the shoulder of the main trail through The Rist. I had passed within feet of the Ogre’s Den and had never suspected it’s location was so close. Laughing at my own inability to discover the feature we were after, we headed back the way we had come. My new friend had parked at the same trailhead and I now had a trail companion on the return to my truck. As much as I am a fan of solo-hiking, there is something fun about meeting a fellow hiker, sharing conversation and swapping stories. Especially when you’ve just successfully completed a quest together! Some trailhead parking. From Phoenix head east on 101 to Pima, north on Pima Road to Dynamite and east on Dynamite to 128th Street. Head south on the unimproved dirt road following the signs to the parking lot trailhead. Yoga gear and apparel provider, Manduka (@MandukaYoga) recently started a regular contest on their Facebook Page for 2012. The nature of their “Happy YOU Year” contest is to “Tell us what you plan to do, or be, in 2012” and every day that week they were giving “a Manduka gift to help that intention become reality“. An amazing and honorable, well-intentioned promotion that I really thought had a great message behind it. So I entered a comment explaining my plan to bring Yoga Practice to the hiking and backpacking community to promote better health and fitness. Well, my story won their attention on that particular day and they announced they were sending me their lightweight travel mat! This was the perfect choice to help bring Yoga to the trail. The eKO SuperLite® Travel Mat is made of natural tree rubber and is a 100% “biodegradable rubber that won’t fade or flake” and offers “superior grip“. The mat is very light for a Yoga mat (2lbs) and is as flexible as a towel or blanket. It easily folds, rolls or wraps up into any duffel, case or backpack. They come in a variety of colors and all have the awesome “Upward Frog” Manduka logo. The mat doesn’t offer a great deal in the way of padding, but it’s the trade-off for having the luxury of being able to take the mat virtually anywhere. I’ve been able to use the mat several times now, some inside just to try it and some outside. I’ve only had it out on the trail once so far and I loved it. It was just enough padding to soften the rock outcropping I used it on. It also packed easily, I simply folded it in half and then rolled it like a bed-roll and strapped it in to the pack where the bed-roll would usually go – perfect! I imagine being able to use it as an extra layer under an inflatable sleeping pad on overnight trips. It would protect the inflatable from potential puncture issues and the grip would keep things from sliding around in the tent. And it would be there waiting for me in the morning for some nice tent-side Sun Salutations! So far I am really happy with this generous gift from Manduka and would recommend it to anyone interested in making trail-side Yoga a part of their hiking and camping experience. Devil’s Kitchen is the ominous name given to the only sink hole in the Sedona area. It sits right at the base of a small peak, known as The Sphinx, that marks the beginning of Soldier Pass Trail. I had stopped in to what has become my regular pre-hike stop to seek trail suggestions and get updates on road and trail conditions around Sedona. The Hike House has only been around about a year and half, but seems to have a very passionate, knowledgeable and helpful staff. I’ve stopped in here before every hike in this area since my first hike up Mund’s Wagon Trail. As I was reviewing trail suggestions, an older couple walked in who had just returned from hiking Soldier Pass that morning and were more than happy to offer their vote for the trail. So, with multiple endorsements for Soldier Pass and an opportunity to make it a more substantial hike by combining the entirety of the Brin’s Mesa Trail, I folded up my trusty map and headed out. Easily enough, the parking lot and trailhead for Soldier Pass Trail (and several connected trails) is just up Soldier Pass Road off of the main drag heading west from Sedona. A short drive through a small subdivision delivers you to a modest, gated parking area that defines the trailhead to Soldier Pass. It’s a well maintained dirt parking area with defined parking stalls, signs and maps but I can see how it’s dozen or so vehicle capacity would be grossly inadequate during peak season. From what I’ve heard, this place is literally crawling with tourists hiking and biking the trails during the peak season. There were a handful of cars in the parking lot when I arrived. Mid-morning, mid-week, off-season I didn’t expect to see a lot of people out but I knew I wasn’t going to be completely alone on the trail. The morning was a beautiful 67 degrees when I hopped out of the truck and packed a few essentials, and non-essentials, into my new Osprey Exos34 (yes, I am testing out a new pack and so far loving it). I slung the new pack over my shoulders and took a few minutes to adjust it properly for it’s maiden voyage then headed out. Just as you get started there is a plaque on a boulder stating the trail was dedicated in 1995. The trail’s construction, signage, and markers were apparently a cooperative effort between the Friends of the Forest and the Famous Red Rock Jeep Tours. A short walk down the well maintained trail quickly brings you face to face with the Devil’s Kitchen. I really wished I’d been properly equipped with a good wide-angle lens in order to capture the gaping hole properly. Aside from the hole itself, the most significant feature is a huge triangular-shaped slab of stone that collapsed in one massive chunk around 1970 and is often referred to as The Grand Piano. Contrary to the dramatic “…all the rock just lying there where it collapsed probably thousands of years ago” promise, reports are that the sink hole collapsed sometime in the 1880’s. I spent a few short minutes trying desperately to capture the sink hole properly with my insufficient equipment before giving up and moving on to Soldier Pass Trail. In the 1860’s and 70’s, General Crook and his men would make camp along this trail down in the wash. They would use the area as a resting point to hunt and fish on their way up from Fort Verde (now Camp Verde) and called the area Camp Garden. General Crook used an existing Apache trail leading up over the pass to raid the Apache food stores in an effort to roost them out of the area and coax them into moving to the Reservation. In later years, Soldier’s Pass would be used by local ranchers to move their cattle out of the canyon and up to cooler elevations during the warmer months. I plodded along the trail happily soaking up the late morning sun and enjoying being on the trail. I walked right past where the Seven Sacred Pools are supposed to be…mainly because I didn’t know exactly what I was looking for and partly because there is no water this time of year. So the Seven Sacred Pools are more like the Seven Sacred Dimples in the sandstone and were thus, missed. There is a point about a half mile or so in where the trail seems to split. One trail clearly heading in toward the canyon and the other trail heading up. As I walked along Soldier’s Pass, higher along the trail I remember looking east toward several significant natural arches in the cliff-side and thinking, “damn, I wish I could get over there and check those out.” Turns out, you can! The trail I saw that seemed to lead into the canyon is a short hike to the arches/caves in the side of the cliff below Brin’s Mesa. I WILL have to go back to check those out. Soldier Pass is a relatively easy trail, the beginning of the trail is not much more than a pleasant walk in scenic country. But the trail does reach a point where you are climbing pretty steadily to traverse the pass. It’s at this point where the views become impressive. Looking back the way you came, the view opens into a wide panorama of the Sedona Valley. You get a full view down the valley into Oak Creek Canyon, across the airport plateau, and beyond. There are also a ton of great spots to stop and have lunch, rest, enjoy the view and snap off a few pictures. However, I imagine this area is uncomfortably crowded in the peak tourist season and I wouldn’t stop here. Once up and over the pass it’s a short slightly downhill walk to the intersection with the Brin’s Mesa Trail. This trail climbs from FR152 on the west end up the mesa and around the ridge the that dominates the east side of Soldier Wash. Soldier Pass Trail hits Brin’s Mesa Trail just about in the middle. Heading right, takes you up across the mesa and down Mormon Canyon to Jordan/Cibola Trails where you can cut back to the Soldier Pass trailhead and parking area. Heading left will take you out to FR152 and deeper into the Wilderness area. I chose to add the miles and explore Brin’s Mesa Trail both directions, taking it out toward FR152 first and then returning back the same way past Soldier Pass and up the mesa. 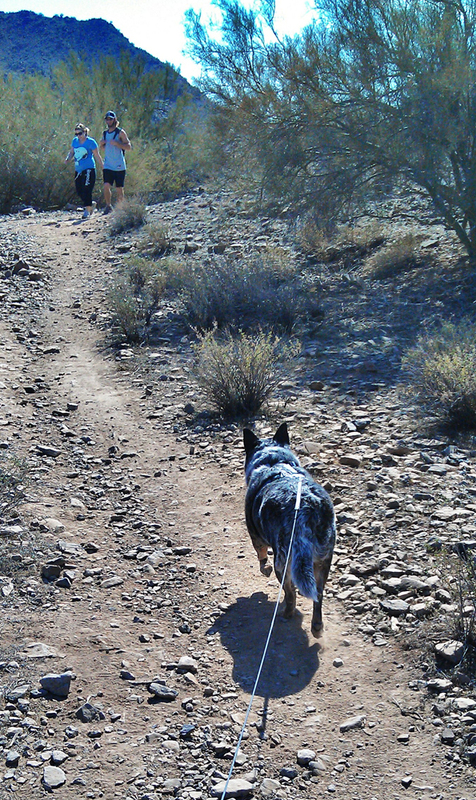 Brin’s Mesa trail has a different character to the west, down the hill. It repeatedly crosses a small tributary of Dry Creek and during the wet season would probably be a lot of fun. As it is, the trail is very nice. You spend most of your time in the trees, a rarity for most of Arizona, and the ground ranges from slightly rocky to soft sand. This was an easy, quiet, pleasant hike and I found myself lost in my own thoughts, ambling freely down the trail simply enjoying the solitude. Before I knew it I had reached FR152 and the end of the trail. I unstrapped the pack, dug out a few snacks and plopped down on a slab of red sandstone for a quick break. After helping a few lost hikers and bikers who weren’t quite sure where they were, I pulled my pack back on and headed up the trail. In no time at all, it seemed, I was back at the intersection of Brin’s Mesa and Soldier Pass. Someone had scrawled arrows in the loose dirt of the trail pointing in the direction of Soldier Pass. Apparently, it easy to miss your turn if you are planning on heading the opposite way I went and down Soldier’s Pass. The sign at this connection does show arrows for following both trails, so just pay attention to the signs and it shouldn’t be a problem. I did run in to a few folks all the way at the far end of Brin’s Mesa Trail who were wondering how they missed Soldier Pass. Getting higher up on to the Mesa you can see the remnants of trees burned out in the fire on Wilson Mountain in 2006. Much of the undergrowth and many of the trees have started to come back, but there is still a great deal of dead sticks standing along the foothills of the mountain. The dead trees I encountered along Brin’s Mesa are presumably casualties of the same 2006 fire. The views from the mesa are fantastic and I found a perfect little knoll to the west of the trail that overlooks Soldier Wash Canyon to stop for a little mid-hike yoga practice. This is the first time I have actually stopped mid-hike for yoga practice but the location was perfect and I had brought along my new light-weight Manduka travel mat just for this purpose. The setting was perfect for it, I couldn’t pass it up. I also found it to be incredibly effective for renewing my energy for the hike. After my short break, I continued my hike across the mesa. As the trail reaches the edge of the mesa, before plunging into Mormon Canyon, the view down the valley opens up again. As before at Soldier Pass, this is the photographer’s vantage point. Take time here to snap off a few impressive shots. The climb descending down into Mormon Canyon was similar to Soldier Pass, it was a quick descent that mellowed out and turned into an easy path. It quickly crawled through the trees offering glimpses of Cibola Rock and Steamboat Rock, the two dominant rock formations above this the trail. It connects to Cibola Trail just before the Jordan Trail Parking lot. This parking lot is paved and much larger than the Soldier Pass parking lot with bathrooms. If the Soldier Pass lot is full, one could easily park here and traverse Cibola trail before heading up Soldier Pass. Cibola trail is a nice short connector trail that cuts across a low pass to join Jordan Trail which I took back to the trailhead at Soldier Pass. It starts off easy enough but has a bit of a climb in the middle to get over the pass. It’s not difficult, nor long but it was described by an older lady I encountered on the trail as “a strenuous hike”, so I guess it’s all relative. I ended the hike in great spirits, happy to have spent the afternoon on the trail and looking forward to a beautiful Nut Brown Ale from Oak Creek Brewery. The perfect way to end a day of hiking in Sedona. Soldier Pass to Brin’s Mesa – Red Rock Secret Mountain Wilderness. Some trailhead parking. From Sedona take Highway 89A west to Soldier Pass Road. There is a small, gated parking area and a Red Rock Pass purchase booth at the trailhead. The parking area closes at 6PM. Year-round but very crowded during peak season. The Devil’s Bridge is a small natural bridge located in the Secret Canyon area of Sedona, Arizona. Even if it doesn’t offer the grandeur of some of the more famous sandstone arches, it’s still the largest natural stone arch around Sedona. The trail is located a few miles up FR152, a sketchy dirt road that can easily be impassable in, or after, bad weather and which is often closed when there’s snow. Even dry, the dirt road is rocky, uneven, narrow in places with patches of deep sand. A 4-wheel-drive is usually recommended but I did see plenty of 2-wheel-drive weekend warriors making their way out there with little trouble. I had to travel to Sedona for work, and after my morning meeting had a few hours to kill. Not nearly enough time to get in a good long hike in the back-country around Sedona, but enough time to hit a small target like Devil’s Bridge. The total trail isn’t much more than a mile round trip. After paying for my Red Rock Pass, I wanted to add a little more distance on to the hike, so I drove a short ways down 152 and found a good spot to park my truck so I could hoof-it the rest of the way to the trailhead. For those who wouldn’t want to add the mileage, there is a small area at the trailhead to park maybe 5 or 6 cars off the road. The trailhead is clearly marked and the trail itself is very well established. The hike was little more than a walk, but a nice walk in incredibly scenic country. It is a consistent and gradual uphill climb twisting along a fairly wide path with the occasional stone ledge cutting the trail. 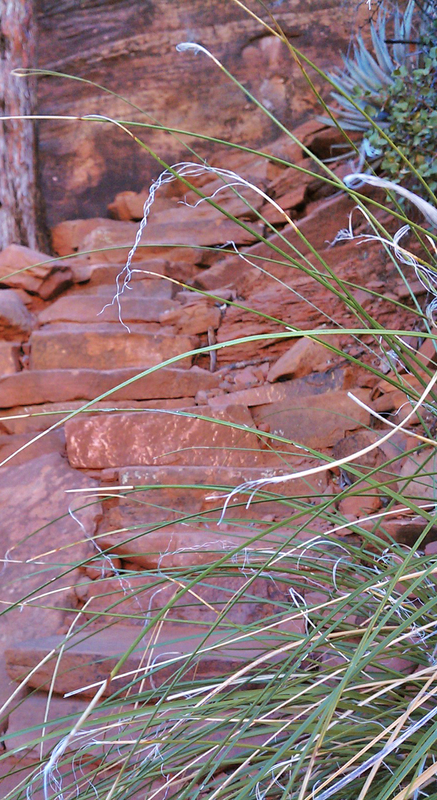 After a short hike up the trail, you enter the Red Rock Secret Mountain Wilderness area. This is right about the time you can get your first glimpse of the natural bridge from the trail. It doesn’t look like much from out along the trail, the real drama of the arch is experienced up close. The trail forks as it approaches the arch. The left trail wanders down easily to the bottom of the Natural Bridge formation. I didn’t go this way. The trail to the right climbs very quickly to a ledge that allows you to approach the bridge from above. The trail literally climbs a series of stone stairs stacked into the cliff-side to reach the top. It’s actually a really well made and maintained trail that leads to the top and brings you up close and personal with the top of Devil’s Bridge. As a Winter hike, this spot spends almost the entire day in shadow and can get pretty cold. It was almost 70 degrees out when I hiked this trail, but in the shadow of the adjacent ridge there was still ice on part of the trail that had not melted away from the previous month’s snowfall. As most of the other hikers ambled along in their jackets and sweaters I bounded up the steps in my t-shirt and shorts in an effort to keep the cold from getting to me. Once at the top, getting cold in the shadow of the mountain, phone/camera dying, running out of time, I really wished I had planned better and could spend a couple of hours here. I would have liked to explore the arch, take my time getting some really nice photos and maybe even have lunch. Instead, I snapped a couple of pictures until my phone died completely, then headed back. 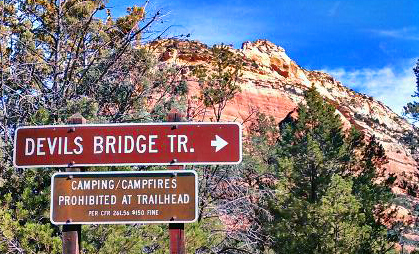 Devil’s Bridge – Red Rock Secret Mountain Wilderness. Some trailhead parking. From Sedona take Highway 89A west to Dry Creek Road. Look for FR 152 on the right, there is a small parking area and a Red Rock Pass purchase booth. You can hike from here or drive the 1.5 miles or so to the trailhead parking area. Year-round but road may be closed in poor weather. This hike was specifically chosen to satisfy two main desires I had in selecting a hike. First, that there was a peak to summit. I had been toying with the idea of focusing on peakbagging in the mountains around Phoenix, and this was the first hike I specifically chose based on that goal. Second, it was a very obscure trail that has seen very little traffic. I really wanted to hike a trail in an area new to me on a trail that was not heavily used nor established. Big Jim Peak sits about 6 miles into a remote portion of desert called Hell’s Canyon Wilderness west of Lake Pleasant along Cottonwood Creek, north of the Phoenix Metro area. Singer ‘Walkin’ Jim Stolz hiked more than 28,000 of trail before his death in 2010. Walkin’ Jim Loop is named for this intrepid outdoorsman, adventurer, singer and author. The trail was originally blazed by Bob Greg and named after Jim Stolz with the latter’s permission. Jim later accepted Bob’s invitation to hike the trail with him in 2010 shortly before his death. I was planning on doing this hike with a small group, but as often happens, people slowly began to back out. When I finally accepted that I was going to be hiking alone, in an unknown wilderness area, I began to doubt the trip and almost backed out myself. I collected information, maps and researched the trail and the area. The morning of the hike, I came very close to cancelling. Then, ridiculous as it may sound, I thought of my dad…and the idea of backing away from a challenge because of ‘the unknown’ suddenly seemed unreasonable. 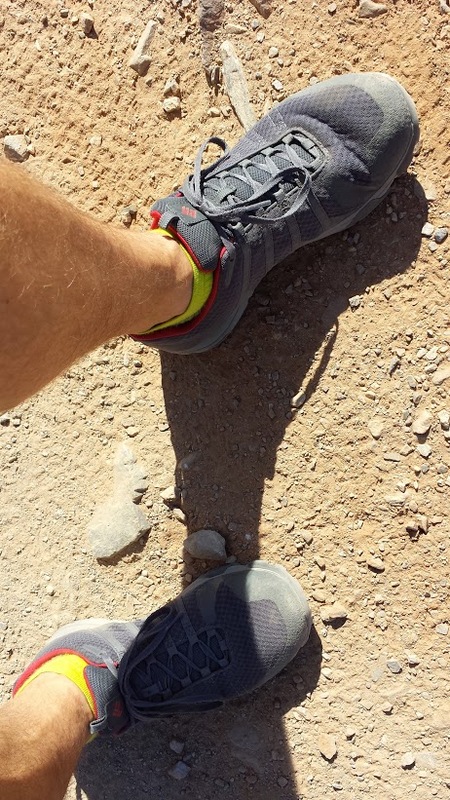 So, I grabbed my gear and followed the directions to the trailhead. There are old ranch roads that traverse this wilderness area. 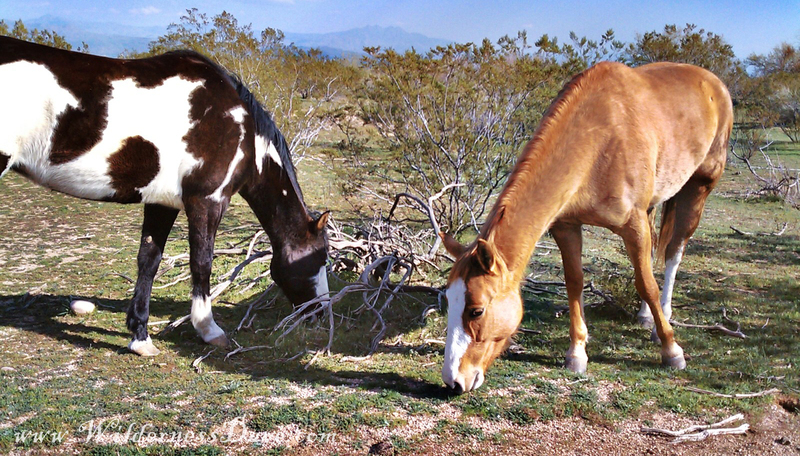 The whole area used to be cattle land and there are still some wild cattle loose in the area, as well as wild burros and a variety of other wildlife. The trail actually crosses some old homestead sites deep in the wilderness with partial fences, debris and artifacts littered about the clearings. The trail is fairly well worn in the beginning and crosses Cottonwood Creek a couple of times. 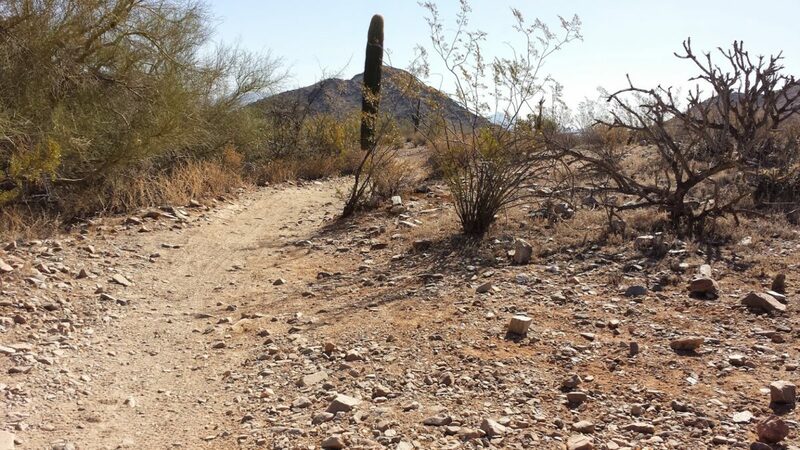 As it takes you further into the desert, the signs of use diminish and the trail becomes more overgrown. It became clear to me a couple of miles in the that main use of the trail was by the local wildlife, not humans, and I was forced to stoop below branches and push through overgrown brush. I had marked my route beforehand on a fairly detailed topo map, and was able to follow the trail easily despite it’s spotty and faint appearance. In places, the trail can disappear completely but is marked relatively well with cairns for those with a careful enough eye to catch them. There were portions of this trail where the only way to continue the route was to walk from cairn to cairn. The topo map was invaluable at times, and allowed me to triangulate my position and reorient myself. The trail itself is a lot of fun. 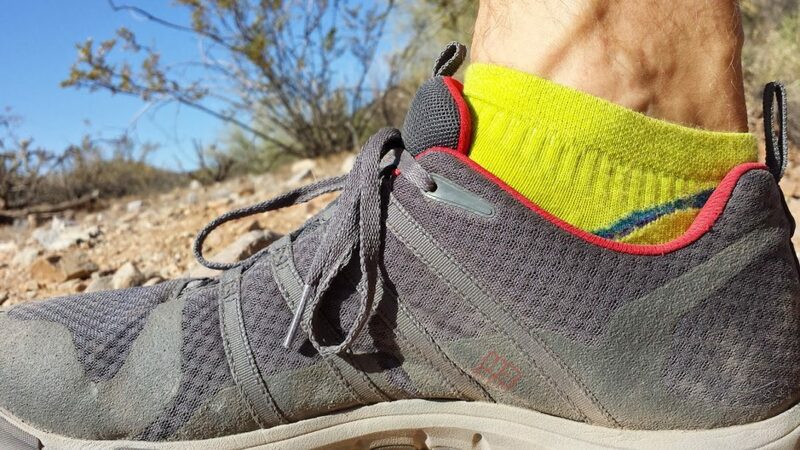 The terrain changes repeatedly, the trail wanders through dense Mesquite forests, crosses dry and wet creeks and washes, climbs up and over various rock formations covered with a variety of lichen and drop in and out of several small canyons. The trail is very remote, and one of the few places where I really noticed the silence. Desert silence is a strange thing, and unique. Occasionally, I could hear the motor of 4×4 vehicles in use on some of the old, abandoned ranch roads. 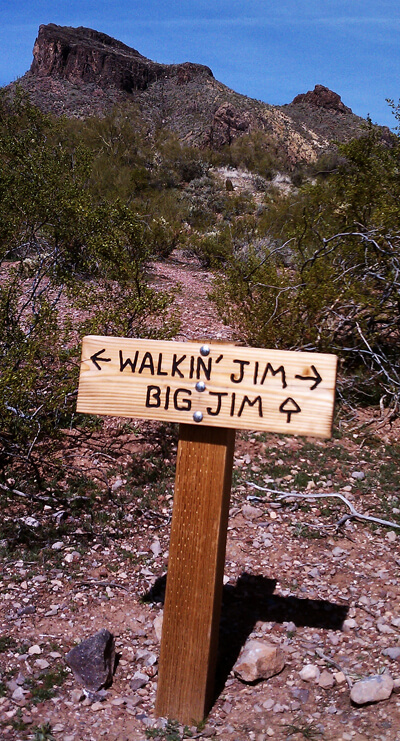 About 4 miles in, there is a sign marking the side trail to Big Jim Peak (peak 3465). The Peak dominates the horizon for a couple of miles prior to this intersection. The peak trail actually heads across the foothills of this small range and into a canyon just below the peak. From here it snakes up the canyon to a saddle between the peak and the rest of the ridge. The trail ends here. 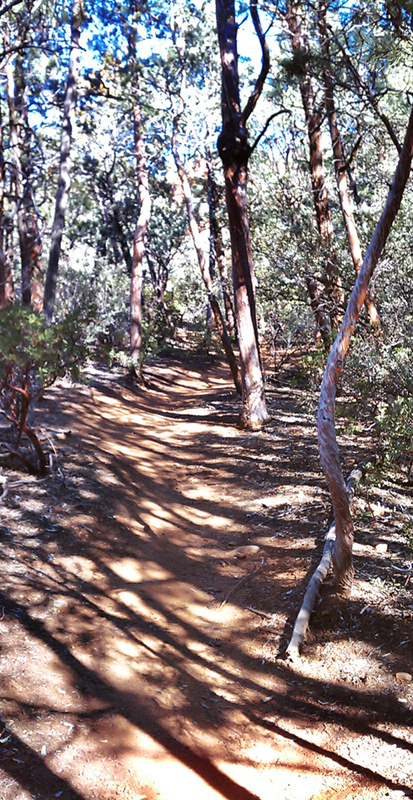 Hiking to the peak is a trailblazing challenge, forcing you to make your own way through the scrub brush and grasses. There are some cairns along the way to help remind you that you are going in the right direction. I eventually crested the craggy rock that surrounds the peak, and was able to boulder hop to the highest point. With a little searching, I was able to find the hidden glass jar with the peak ledger in it. It had rained the previous week so the ledger was still slightly wet and I had trouble writing my name on the page. The last entry was from October of 2008. Though I’m sure there had been other visitors, the idea of being the first one on this summit in over 2 years was exciting. I pulled off my pack and spent some time at the top watching eagles hunt along the cliffs below my position. I dug my lunch out of the pack and found a relatively flat rock to sit and enjoy my lunch. From the peak, I had a great view of Lake Pleasant to the East and the remaining desert wilderness to the west. It’s a fantastic vantage point and I was disappointed I had decided not to bring my good camera. I laid down on a boulder for a bit to enjoy the sun. When I decided to start down, I sat up and grabbed my gear and felt a sharp sting on the back of my thigh. The intricate, animated dance that followed had to have looked insane. luckily, I was alone and by the time I had stripped out of my pants the only evidence left of my visitor was the barb and venom sack still pulsating from the scorpion that got me. I had never been stung by a scorpion before, but living in Arizona, you know what the dangers are and I now had a sense of urgency to get back to civilization. I had no idea if I was allergic, or if my body would react weird to the sting and I was 6.5 miles from my truck. The return hike was a little of a blur. Mostly just pushing hard to get back. 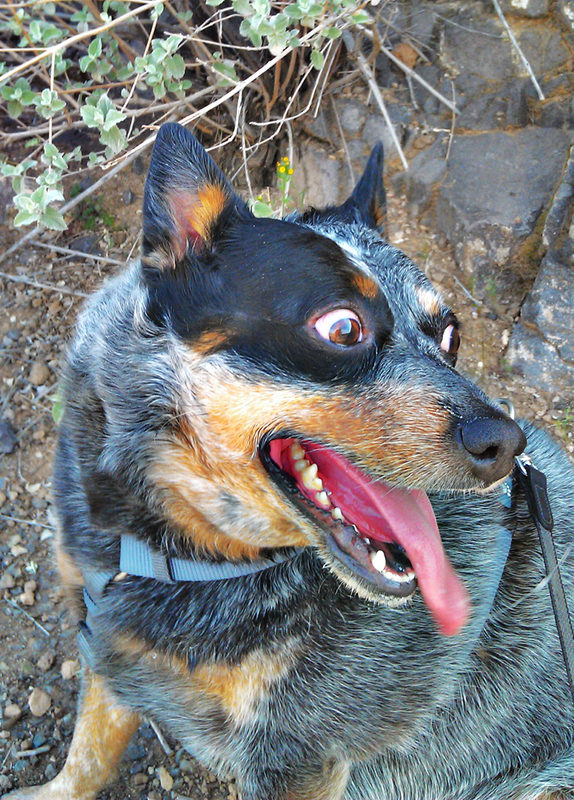 I was running low on water, it had gotten warm out since I had started my hike and I was feeling fuzzy. I don’t know if it was lack of water, fatigue or the scorpion but the hike back was way harder than the hike in. When I finally got back to my truck, I felt relieved. I downed some Gatorade, loaded my gear and started the drive home.